Old Etonian Lance Macklin was the son of British entrepreneur Noel Macklin, founder of both the Invicta and Railton car companies, as well as Fairmile Marine, a manufacturer of motor gun and torpedo boats during World War Two. 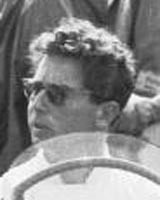 Sadly, his racing career will be largely remembered for one tragedy at the 1955 Le Mans 24-Hour race when Pierre Levegh's Mercedes struck the rear of Macklin's Austin Healey and hurtled into the crowd, killing more than 80 people. Macklin always claimed he had been forced to swerve to avoid colliding with Mike Hawthorn, who was braking to enter the pits, and Levegh was unable to avoid hitting him. Hawthorn and Macklin were friends, but three years later Hawthorn denied any responsibility for the accident in his autobiography. Incensed, and feeling that he was being blamed, Macklin sued but the case never came to trial as Hawthorn himself was killed in 1959. A few months later, in his second race back, Macklin narrowly avoided another crash which killed two drivers at Dundrod and he was persuaded to give up racing there and then by his fiancée. Macklin was highly regarded and many felt he could have achieved far more were it not for his laid-back approach. He got into racing when he bought a half share in a Maserati - he was barred from entering an event on the Isle of Man soon after on the grounds he had never raced - and he was forced to hone his skills racing round London after nightclubbing. He soon made his mark on the track and in 1949 took a place in the Aston Martin team. In 1950 he finished fifth at Le Mans alongside George Abecassis, and as a result Abecassis invited him to join an underfunded fledgling Formula 2 HWM team which included Stirling Moss. The cars were never able to compete with the big manufacturers but they nevertheless enjoyed some success despite Macklin and Moss earning a reputation for spending as much time chasing girls. Still with Aston Martin, he came third at Le Mans in 1951, his career high, but in Formula One the HWM cars were always off the pace and in 13 starts he never scored a point. He left Aston Martin in 1953 and joined Bristol - "probably the worst mistake of my life" - and a year later switched to Austin Healey. He was an all-round sportsman who boxed at Eton, played polo in Argentina, and was a good enough skier to train with the French squad in 1937 before switching to the British team where a knee injury ruined his dreams. After retiring he worked in various jobs before emigrating to Spain.